Located several miles south of Pismo Beach, Oceano's claim to fame is the State Vehicular Recreational Area (often abbreviated to SVRA). 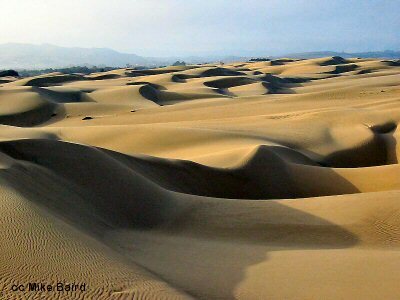 One of the largest dune areas in California, it is a haven for dune buggies and all terrain vehicles. Note Well: There could be a source of confusion here. This is a California state beach and recreation area, and they have re-named this "Oceano Dunes State Vehicular Recreation Area" or SVRA. Google maps show it as "Pismo Dunes SVRA". They are the same place. These dunes are part of a the largest complex of sand dunes on the California coastline. Other parts of this complex that are accessible are the Oso Flaco Lake Natural Area (see below) and the Rancho Guadalupe Dunes Preserve just over the county line in Santa Barbara County. The dunes can get over 500 feet high in places and are the preferred nesting spots for the western Snowy Plover. A concerted effort has been underway for a number of years to cordon off areas so that the birds are undisturbed. It has been a success with the number of nests counted increasing most years. It is also the reason that dogs are not allowed on these beaches. The nesting season begins March 1 and extends through October 1. While everyone associates California and "hippies" and the 1960's, the dunes attracted a similar bunch a generation or two earlier. These folks called themselves the "Dunites" and a bit of history regarding them can be found here. There are 5 1/2 miles of beach and dunes open for vehicular use and it is the only beach in California on which vehicles are allowed to drive. There are also many campsites available at this beach and on-line reservations can be made. A very nice, but little-visited part of this state park is the Oso Flaco Lake Natural Area. It takes a bit of doing to get there, but any effort is well rewarded with a lovely and quiet walk through a riparian and lake environment, through the dunes and out to the ocean. From Oceano, take Highway 1 south approximately 10-11 miles. Turn right on Oso Flaco Lake Road. Follow this to the end (about 3.5 miles), which will be the parking area for the natural area. Parking is $5. From there is a nice walk, through woods, over the lake and onto a boardwalk through the dunes to the ocean. This is a very good area for birding. This area is a mecca for RVs as well. There are many RV parks for short and long-term stays. You will also find a number of RV sales and repair businesses along Highway 1. For those of you wanting more in-depth information on RV trips and RV living, this nice site gives great information and lots of it. 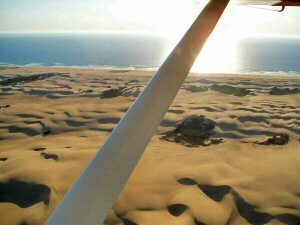 Banner Airways offers plane rides from the Oceano airport, giving you a great view of the beach and the dunes. Besides the dunes and beach, there is a great place for family fun at the Great American Melodrama and Vaudeville. Over the top, low-brow fun and entertainment. A great place to let yourself go and have some good laughs after a day at the beach. The cast doesn't take itself very seriously and neither should you. This seems to fit right in with the city's temperament. A good place to have some fun and relaxation. 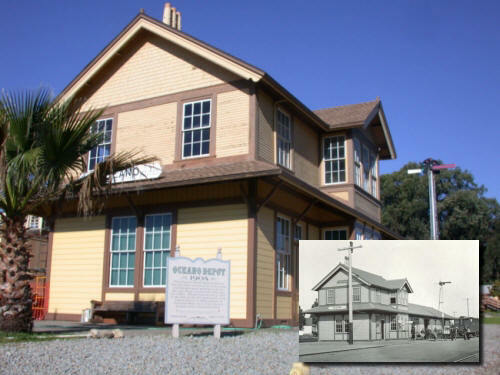 An interesting restoration of a 1904 train depot with historical artifacts and memorabilia of the area. 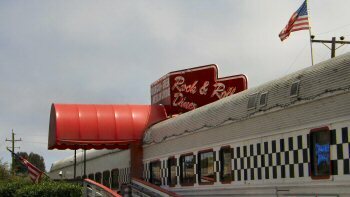 You might want to try eating at a real classic diner, created out of two vintage railroad cars at the Rock & Roll Diner. An unusual (and very good) combination of American, Mexican and Greek specialties served in a retro atmosphere complete with 50's and 60's music. We had lunch there recently and greatly enjoyed it. I had the Greek gyro (which is hard to find anywhere else around here) and my wife had bacon wrapped shrimp. They also serve Firestone-Walker beers which have quickly become our favorite. F-W is a local brewery and has won numerous awards for their beers.